Note that direction Ratios of 1st line is (1 , 2 , 3) and the direction Ratios of 2nd line is (2 , 3 , 4). we know that if a1,b1,c1 and a2,b2,c2, are Direction Ratios of line L1 and Line L2 . Since these equations of lines are not in standard form , in order to reduce these equations to standard form we shall have to make the coeffs of x, y , z unity. In 1st part of equation (1) divide the num and den by 2 , and in 2nd part divide num and den by 3. To test whether given lines are parallel to each other , just check their direction ratios , id they are proportional to each others , then The given lines would be parallel to each other. If the Direction ratios of 1st line is (1,2,5) and Direction ratios of 2nd line is (2,4,10) . 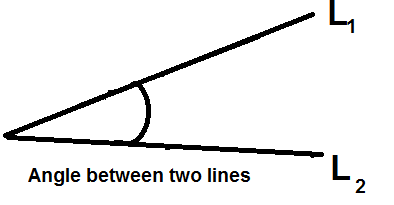 If we take 2 common from direction ratios of 2nd lines then we have same direction Ratios as that of 1st line hence These lines are parallel o each other. How to prove that the given lines are Perpendicular to each others. If we calculate the angle between any two lines and it comes out to be 0 ( ZERO ) then these would be perpendicular to each others. And D. R. of 2nd Line are ( -2 ,3 ,3 ). Want to check the solution of this problem ? Thanks for your precious time to read this post regarding how to find the angle between two lines in Cartesian form.